Find out how food blogger Kenan Hill of Kenan Hill Blog dishes on her favorite “Upside Down” Butternut + Bacon Holiday Quiche recipe, perfect for holiday brunch. Prepare the crust in a food processor, pulse flour, salt, and cold butter until butter is the size of peas. Add ¼ cup (4 tbsp.) cold water in a steady stream, pulsing the dough just a few times. Dough should stick when pressed together. If necessary, add more water, 1 tbsp. at a time. Shape dough into a 1-in. thick disc and wrap tightly with plastic wrap. Refrigerate for an hour or until firm. Dough can be made ahead and kept in the fridge for up to three days or the freezer for a month (thaw dough in fridge overnight). You can also substitute pre-made pie dough. Preheat oven to 375°F. On a floured surface, roll pie dough evenly to ¼-in. thick. Cut shapes from dough with cookie cutters and place on a baking sheet lined with parchment paper or a silicone baking mat. Refrigerate cut dough for 15 minutes while you gather your filling ingredients. Beat one egg with a splash of water and use a soft pastry brush to lightly wash chilled pie dough shapes. Bake at 375°F for 20-25 minutes or until golden brown and crisp. Set aside. In a large bowl, whisk together eggs, milk, salt, and rosemary until eggs are well-beaten, then add cheese. Set aside. Preheat a 12-in. 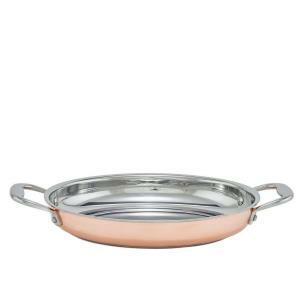 oval au gratin pan or 10-in. ovenproof skillet over medium heat. Add diced bacon or pancetta and cook until browned, 5-7 minutes. Remove cooked bacon from pan and place on a paper towel or brown paper bag. Add diced butternut squash to pan and cook until just fork tender, 7-10 minutes, adding oil or butter if necessary to keep from sticking. Then, add minced garlic and cook for 1 minute. Remove pan from heat and distribute bacon and cooked squash evenly over bottom of the pan. Carefully pour egg mixture into pan. Bake quiche at 375°F for 25-30 minutes or until mostly cooked through–it should still jiggle very slightly in middle. Let cool slightly, then serve warm topped with pie crust cutouts. Store leftover quiche in an airtight container in the fridge. Store leftover pie crust in an airtight container at room temperature. Many nutty, sharp, or aged cheeses work well with this quiche: asiago, parmesan, pecorino, sharp or aged cheddar. Freshly grate a block of cheese for best results. The type of (dairy) milk you use doesn’t make a significant difference, so use what you have on hand. I tested everything from skim to whole with a good result. For a vegetarian quiche, omit bacon and increase salt in egg mixture by ½ teaspoon. For a gluten-free quiche, omit crust altogether. If you don’t have an ovenproof au gratin pan or skillet, cook bacon and squash as directed, then move it into a greased baking pan or cake pan and pour the egg mixture in. Baking time may take a few minutes longer since the pan isn’t preheated. For more like this “Upside Down” Butternut + Bacon Holiday Quiche recipe, check out our Holiday Recipes on The Home Depot Blog. Shop our Cooking & Food Prep department at The Home Depot to find all your cooking needs this holiday season.